Your feet work hard, and rarely get the credit that they deserve. In fact, you may not give your feet a second thought—that is, until they begin to cause you pain or disrupt your daily life. No matter your age, foot and ankle pain can put you on the sidelines until the problem is addressed and treated. Advanced Foot & Ankle Specialists of Arizona is here to help you return to the activities you love best. Whether you climb Camelback Mountain every weekend or simply like to take an evening stroll without pain, our foot doctors will offer a comprehensive treatment and recovery plan to get you back on your feet as quickly as possible. Advanced Foot and Ankle Specialists of Arizona is proud to offer quality care and a personalized patient experience. Each highly skilled physician focuses on providing his patients with the most comprehensive and progressive treatment for a wide range of foot and ankle problems affecting both children and adults. Our treatment objectives are to provide relief from painful symptoms and to correct the underlying issue. The doctors focus on educating each patient and involving her in her own healing process. 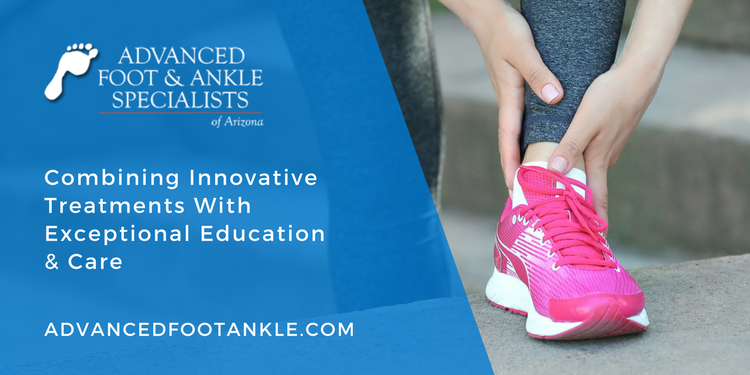 Advanced Foot and Ankle Specialists of Arizona is committed to providing personalized patient care, specializing in areas of sports medicine, diabetic foot care, pediatric foot care, and surgery—all part of a wide range of foot and ankle-related conditions. Is Foot and Ankle Care for Me? Foot and ankle pain and injuries can occur at any age, and each of our highly skilled physicians focuses on providing their patients with a personalized experience and specialized care so those patients can get back to their normal activities as quickly as possible. For individuals whose feet hurt the moment they step out of bed in the morning to those who go to bed with throbbing, burning pain, we are here to help. When you visit our foot and ankle practice, you will receive our full time and attention—in fact, your initial appointment with us will be double that of our neighboring competitors. Unlike other doctors, we have dedicated our entire professional lives to foot and ankle care, and we are passionate about helping you overcome your pain and enjoy all that happy, healthy feet have to offer! Advanced Foot & Ankle Specialists of Arizona offers patients a full range of foot and lower leg service and treatment options for a wide variety of conditions. We work with local hospitals and surgical centers, as well as offer many outpatient procedures at our own offices. We offer custom orthotics and bracing, as well as comprehensive physical therapy options to ensure long-term success. Pediatric Foot Health: Sometimes, your child may not outgrow his foot pain. Plantar warts, flat feet, and chronic heel pain are just a few of the pediatric foot conditions we treat regularly. Sports Injuries: From blisters to sprains to fractures, our practice focuses on offering athletes of all ages and abilities the finest treatment and therapy for their injuries. Diabetic Foot Care: Diabetes can wreak havoc on a person’s skin, nerves, and bones, especially in the feet. If you are suffering from diabetes-related chronic foot wounds or neuropathy pain, our practice can help. Nail and Skin Care: From unsightly fungal nails to athlete’s foot and other skin conditions, our practice offers the latest and most effective treatments for your nail and skin needs. Heel and Arch Pain: Heel and arch pain includes some of the most common—and painful—conditions we treat. Whether your pain is the result of plantar fasciitis, nerve pain, neuroma, flat feet, or bone spurs, our practice can offer you a wide range of treatment options. Surgical Needs: When conservative methods have not or will not improve your condition, our foot and leg surgery options can help you overcome your foot and ankle pains once and for all. Whether you recently suffered an injury or need treatment for a painful or ongoing foot condition, the doctors and staff of Advanced Foot & Ankle Specialists of Arizona are here to help. To schedule an appointment or to request information, simply click on the appointment request button, or call one of our two offices: Chandler at 480-963-9000 or Gilbert at 480-981-1800. In an ideal world, everyone is born with 5 senses. The senses of smell, sight, sound, touch and taste. But individuals with high blood glucose and blood sugar levels often experience a loss of one of these unique senses. Damage to nerves and blood vessels greatly affects their sense of touch – in particular, the loss of feeling in their feet. You do not need to be an athlete to injure your feet. People of all ages have suffered from debilitating pain resulting from an injury to their heel or arches, and at Advanced Foot & Ankle Specialists of Arizona, we are dedicated to getting you back on your feet as soon as possible. Whether the skin on your feet is giving you grief or your toenails are sore or unsightly, our Valley podiatry practices can help you get started on beautiful skin and nails. Whether your problem is painful or simply embarrassing, we can help you say goodbye to unsightly or uncomfortable skin and nails. Visit us today to see how our practice can help you get the healthy feet you deserve. Many parents write off foot and ankle pain in their children and teens to growing pains, but persistent pain is not something that your child should have to cope with. At Advanced Foot & Ankle Specialists of Arizona, our doctors have experienced treating foot pain in patients of all ages—visit us today to help your child get back to the activities they love! All athletes—from four-year-old soccer players to 300-pound NFL linemen—have at least one thing in common – susceptibility to injury! Even active people who don’t consider themselves “athletes” still have a certain degree of injury risk when exercising or working out. At Advanced Foot & Ankle Specialists of Arizona, we generally believe in pursuing conservative treatment options that will get you back on your feet, fast. When problems persist, however, a more aggressive approach may be necessary. When this occurs, our state-of-the-art surgical options can help you end your pain and address your symptoms head-on. Learn more about our foot and ankle surgical options today.